But don’t be confused by the number. It’s actually the second of three hydroelectric plants that the legendary gold mining company constructed along Spearfish Canyon. The first plant, built by Homestake back in 1904, is hidden behind trees and bushes that skirt Highway 14A leading up the canyon just south of the Spearfish Country Club. The third plant was Homestake No. 2, located about seven miles up the canyon from Spearfish between Maurice and Savoy. It was built in 1917. The building still stands, but it is no longer in operation. While Homestake was interested in electrifying its expansive mining operation even before 1904, they weren’t the first to actually harness the power of Spearfish Creek to produce electricity. 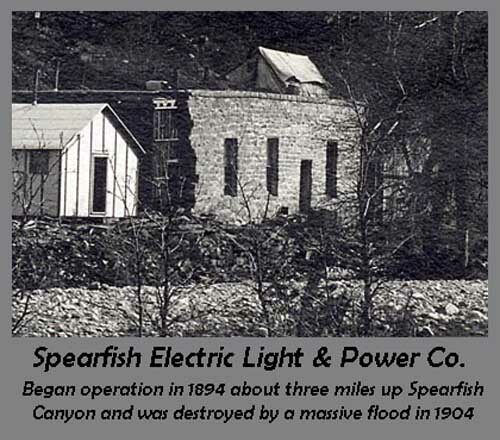 That achievement was claimed by a group of Spearfish residents, working with out-of-state investors and others, to build what would become known as the Spearfish Electric Light and Power Company. The following four-part story tracks the formation and operation of the company, which was the first serious effort to create hydroelectric power within Spearfish Canyon. It was a precursor to other Homestake hydro plants, including Homestake No. 1, which continues to provide electric service for Spearfish, just as it has done for more than a century. Thanks to good friend Don Matthesen of Spearfish for his contributions and suggestions in preparation of this story. I hope you enjoy this bit of Black Hills history. Go to: PART 1 - "ELECTRICITY ON THE HORIZON"
Copyright 2016, Larry Miller. Awesome Inc. theme. Powered by Blogger.